Barack Obama said Saturday, Hillary Clinton is welcome to keep campaigning as long as she wants. "My attitude is that Senator Clinton can run as long as she wants. Her name is on the ballot and she is a fierce and formidable competitor," said Obama, adding that the notion that Democrats have been split by the prolonged nominating contest "is somewhat overstated." Clinton, a New York senator, on Friday vowed to stay in the White House race, rejecting mounting pressure from some Democratic leaders to bow out and let the party focus on defeating the presumptive Republican nominee, Arizona Sen. John McCain, in the November general election. Clinton trails Obama in the race for 2,024 Democratic nominating delegates. But she says she can still beat the Illinois senator and that all Democrats should get a chance to vote. "There are some folks saying, 'well, we ought to stop these elections,"' she told a rally in Indianapolis. "I didn't think we believed that in America. I thought we of all people knew how important it was to give everyone a chance to have their voices heard and their votes counted," Clinton said. Holding out an olive branch to her supporters, Obama said Clinton "obviously believes that she would make the best nominee and the best president and I think that she should be able to compete and her supporters should be able to support her for as long as they are willing or able." "I think it is important to pivot as quickly as possible for the superdelegates or others to make a decision as quickly as possible," Obama said, to give the nominee time to choose a running mate and plan for the party's convention in August. Obama also downplayed fears that the contest will continue to divide Democrats in the election against McCain. "You can't tell me that some of my supporters are going to say 'well, we'd rather have the guy who may want to stay in Iraq for 100 years because we are mad that Senator Clinton ran a negative ad about Senator Obama. And I think the converse is true as well," he said. Meanwhile, former Vice President Al Gore said Thursday he expects the heated Democratic race will be resolved, according to The Associated Press. "What have we got, five months left?" Gore told the AP. "I think it's going to resolve itself, but we'll see." Gore didn't say whether he expected the race to be settled before the Democratic National Convention in August. Gore's name has been invoked among some Democrats as a neutral party elder who could forge a compromise between the two candidates, or even appear on the top of the presidential ticket himself. Earlier this week, Rep. Tim Mahoney, D-Florida, suggested Gore, the party's 2000 presidential nominee, could assume the role of a compromise candidate if neither Clinton nor Obama could broker a deal. "If it [the nomination process] goes into the convention, don't be surprised if someone different is at the top of the ticket," Mahoney told a Florida newspaper, adding Gore could be that choice. We're all tired of primary season. 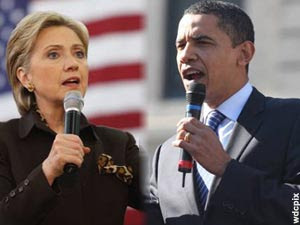 Yet even as tired as everyone is, Senator Obama is giving Senator Clinton room to campaign. This is a gracious act by a gracious man. Senator Obama is taking the high road, all the way to Denver. Please keep the pie fights to the threads -- such as this one -- which are about Obama/Clinton, and leave the rest of the threads to other concerns.